DD Poker is a helpful simulation and training software that is ideal for learning strategies associated with playing solid poker, whether live or online. A fully-functional display allows you to assess the pot odds, hand strength, and relative value of your hand against other possible hands. If you're just getting started, there's even an adviser to help you along the way. There's a built-in tournament clock to run your own home game that's a nice add-on to have. 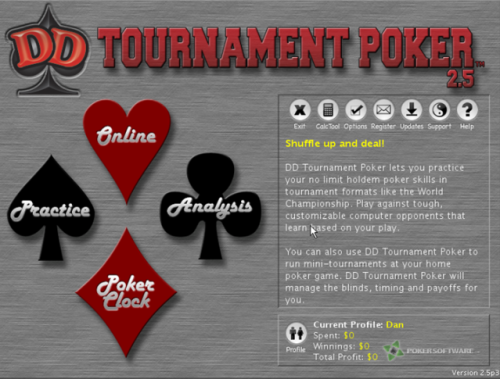 If you’re looking for easy to use poker simulation software to sharpen your game, then look no further than DD Poker. You’re never alone when you play in this software; there’s full in-game adviser functionality, extensive back-end stats, and even a tournament clock option so you don’t have to buy that separately. Your current hand is displayed with the five cards that make up your hand plus its value. A list of the various ways to improve your current hand and the percentage of the time each will occur. An indication of hand strength, showing the percent of the time your hand will win. A fully-functional calculator to assess your odds on the current hand plus show the various “outs” you have on subsequent streets. An adviser giving you the optimal strategies in every hand and reasoning behind it. You can also change the adviser in-game strategy to make it looser or tighter and see what happens. Cheat options include all cards dealt face up, all cards dealt face down, and the ability to see folded and mucked cards. The ability to change player types that you’re facing to sharpen your play in certain table situations. 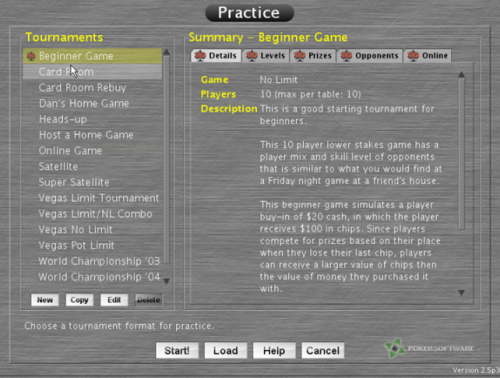 A tournament clock is also included in the software, which allows you access to your very own home game tournament clock. Why buy another program when you have an excellent tournament clock in DD Poker? You can load your own tournament structure in and save it for future use. You can flip between blind levels and pause and start the clock on a click. If you're feeling lucky, you can even play online against other users of DD Poker. A range of tournaments is available for you to put your new-found skills to the test.